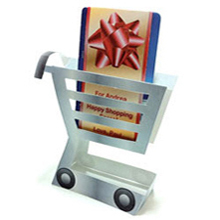 Add a personal touch to a practical gift using this creative gift card holder cart. 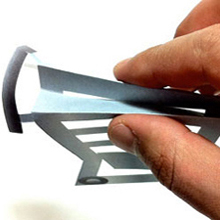 Simply print, cut, and assemble this 3D paper craft shopping cart. Personalize any gift card with an optional gift wrap. The names and message are visible through the cart slots. This unique presentation is the perfect way to dress up a convenient and basic gift. Surprise your loved one with a custom photo gift card under the wrapping. Assemble your gift card holder cart using the detailed photo instructions below. Download the Gift Card Holder Cart Template PDF above. Click and highlight the wording in the PDF form fields on the optional gift card wrap to personalize the names and message. In Adobe Reader, select File, Print (input page numbers 2-3 only) on card stock paper and make sure Page Scaling is set to None. 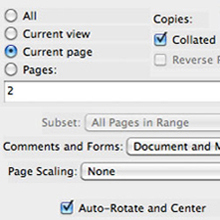 Set paper quality settings to card stock or heavy paper before pressing the print button. 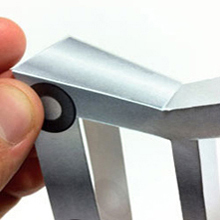 Use the back of a butter knife or paper clip to score the fold lines. The fold line guides are the brown dashed lines. 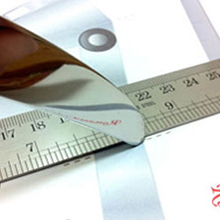 Line up the butter knife back on the fold line guide, then place the ruler next to it to keep straight. Push down and slide along guide lines. Repeat for each fold line. 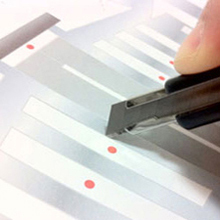 Use the craft knife to cut out each of the shapes with the red dot in the middle. 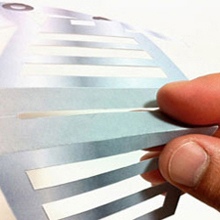 When cutting, keep the cut path on the line so that you do not see white around the edges. Cut along the outside lines of the cart and the personalized wrap. 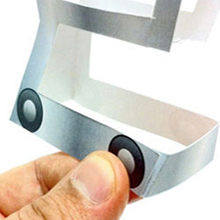 Fold down along the score lines to form both sides of the top of the cart. Pinch the top of the cart down as shown so that the card slot makes the shape of an M while pushing the handle up. 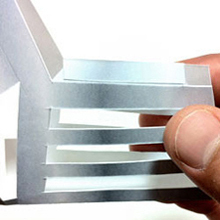 Fold the tabs on the bottom of the cart on both sides along the score lines. Use double sided tape or glue on the grey rectangle tab to attach the bottom basket as shown. Fold the back of the cart on the score lines and place double sided tape or glue on the tab to attach as shown. Attach the bottom wheels tab with double sided tape or glue. 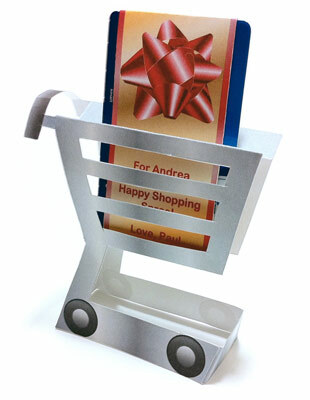 The cart holds a standard sized gift card alone or with the included personalized wrap. Give in a small wrapped box. Place in front of the TV. Once you're both in the car, place in her/his hand and go shopping. 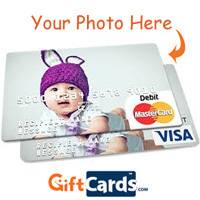 Upload a personal photo onto a GiftCards.com debit Visa® or MasterCard® gift card. Choose your amount and a short message embossed directly on the card. Make a simple gift more unique.